David becomes increasingly more desperate, and his extreme behavior is causing fights with everyone who cares for him: with the devilish Mr. Black, the saintly Mr. White, and even with his loving parents. But his quest goes on, driving him to break the rest of the ten commandments in order to draw out the elusive divinity to face a grief stricken man. Until, finally, he is faced with the most serious commandment all: "Thou shalt not kill." Will he do it? Or will God stop him? "Superbly engaging and wickedly barbed tale of lost love, disillusionment and grief-filled reaction that is both hilariously acerbic and potently thought-provoking." —Win Wiacek, NOW READ THIS! 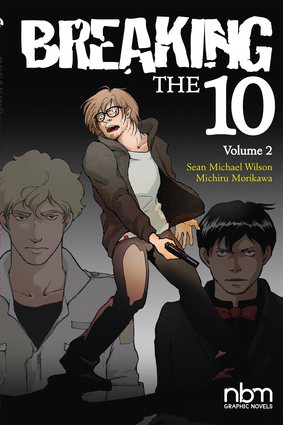 Sean Michael Wilson is a comic book writer from Scotland, now living in Japan. He has had many books published, including a graphic novel version of A Christmas Carol ("Best of 2008," Sunday Times) and AX:alternative manga ("Best ten books of 2010," Publishers Weekly). Michiru Morikawa is a Japanese illustrator and manga artist. She won the prestigious International Manga and Anime Award in Britain, and received a prize for Best New Manga Artist from Kodansha.